I have my hive scale up and running. The hive weighed 198 lbs on last Sunday. Thursday evening the hive weighed 216 lbs. The nectar flow is on around a good part of MN. Adrian from Hudson, WI had his hive scale go up 45 lbs in 8 days. My friend who runs 200 colonies in the northwest suburbs recently checked his colonies and all of his yards had nectar coming in. I had a customer that had a weak colony stop by with some frames that she thought looked suspect of a brood disease. We looked them over. No discernible odor, no shrunken cappings, some perforated cappings, some dying brood. All the brood that was dying was older larvae. We tried a ropiness test but I could not find any dying brood in the milk chocolate color stage of decay. The ropiness test should be done on these larvae. Puncture the larvae with a toothpick. If it is American Foul Brood (AFB) it should rope out more than 1 inch from the larvae. I didn't see anything like that. I did see two dead larvae that had died with there tongues sticking up. This is an AFB clue. There were some larvae that died in a hard white state. This is Chalkbrood a fungus. No cure for this, it usually goes away. But back to the AFB. We took the frame into my shop and used the black light to look for AFB scale. AFB scale is a dead larvae that has died and dessicated to the bottom of a cell and formed a hard scale. AFB scale is highly contagious and can only be removed only with high temperature therapy, burn it. Removing the scale is a must or the colony will get reinfected after a regimen of antibiotics is over. AFB scale glows green when a black light is shined on to it. AFB scale is always on the bottom of the cells. When looking for it, have the frame with the top bar at your chest and leaned slightly back. Shine the light so it hits the bottom of the cells. So we took the frame and hit it with the black light. There were four cells of AFB scale on each side of the frames. They were glowing green and stood out from the other cells. 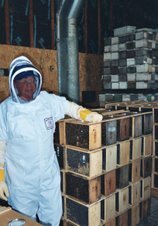 This beekeeper with a few clues, reacted to question of the health of her colonies. She had a weak colony with some discolored larvae and got advice because she was unsure and never had it before. She not only caught the AFB in a very early stage, but protected her other colonies from hopefully falling victim to this brood disease. She is going to burn the infected frames and treat the colony with Terramyacin. The Chalkbrood should clear up as the population increases. She will keep an eye on all the colonies now to make sure they stay healthy. 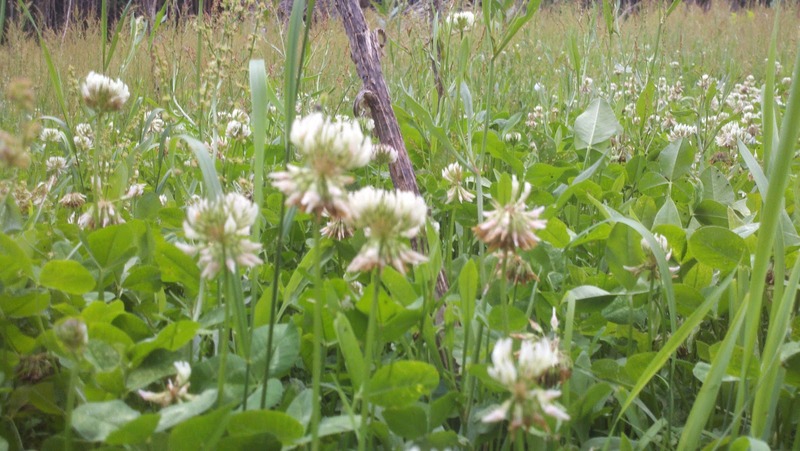 White sweet clover is blooming all over the metro area. This is one of our major honey crops. 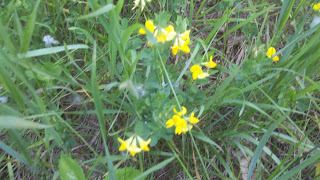 It looks like yellow sweet clover. The honey is white and is highly sought after by most Minnesotans. I have sumac blooming at my home. Sumac produces a reddish honey. That would be light amber in color. Freeway right aways have a purple vetch carpeting the ditch. The nectar flow in the metro should be at max right now. This would be a good time to put on comb honey. I worked some colonies today, Really hot in the bee jacket. The wind helped a bit. Bees hanging out on the front of the hive. This is normal, they are hot like we are. We should be getting some rain tonight and that should keep the plants from drying out. The upcoming week should be perfect bee weather. The honey collection should be going full bore in and around the metro area. Now is the time when the bees will fill supers quickly. Check on supers every 5 days. A quick peek to see how they are doing. Keep ahead of the bees and add two supers at a time. Supers that have undrawn foundation go directly on top of the brood nest. Bees have a hoarding instinct, they will work very hard to fill their hive with honey. By keeping ahead of the bees with supers keeps them in high gear. This also is the time of year when healthy bees fed a diet of proper nutrition show their stuff. Healthy bees live longer, 35 - 40 days compared to poor nutrition bees 25 - 30 days, and a hive of healthy bees that have been fed a proper diet will produce more honey than bees that have not had a proper diet of pollen and honey. Stubborn bees not moving through a queen excluder? Removing the excluder until there is some comb being drawn out in the supers, then put it back on. It is fun to search the plants around the hives foraging area to see what the bees are working on. They may not always be your bees but the education of nectar producing plants helps a beekeeper figure out the nectar source of the honey crop sitting on top of the beehive. On my trip to my day job I get the opportunity to look in the ditches for blooming plants. I have seen White Dutch Sweet Clover, Red Clover, Birdsfoot Trefoil, Yellow Sweet Clover. 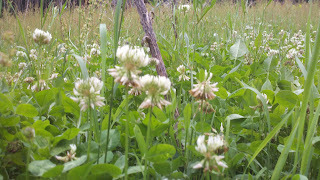 The Red Clover I have heard has a deep flower and honeybees tongues are too short to get nectar. Driving through Stillwater tonight I noticed the Basswood trees starting to bloom. They weren't fully open but will be by Sunday. The Basswood flow is never dependable. When it flows it can really be a super buster. The crop of Basswood honey, when it adds to the other nectars collected can lead to a huge honey crop. I am sold out of queens for 2012. Due to a family event Nature's Nectar will be closed on Thursday. Driving back from Hackensack yesterday, I noticed Yellow Sweet Clover every where from Monticello south to the metro area. Some beekeepers have been getting a nectar flow. The cool weather of late has slowed it up a bit but the warmer outlook should put it back on track. So everyone in the metro area should be having a flow right now or will very soon. Supers should be on hives that have finished drawing out their boxes. The burr comb on this overwintered hive has dark comb on it. Notice the new white edges. This is an indicator that a nectar flow is on. When nectar is coming in, new white comb will appear in a hive. Many new beekeepers that are still drawing foundation should be checking them every five days now. There are more bees in the hive now and the bees can now finish off a box very quickly. If a hive is close to finishing the last brood box, supers should be put on sooner than later. Supers go on the hive two at a time. If supers are put on too late, the bees will fill the brood boxes with honey and there will be no place for the queen to lay. Close attention to strong hives right now to prevent swarming. Still check for swarm cells on a 7 day schedule. Losing a hive to a swarm will mean no honey from that hive this year.